62 • RV PRO • September 2018 rv-pro.com R V M A N U F A C T U R E R S LIBERTY OUTDOORS Uniontown, Ohio-based Liberty Outdoors has two reveals prepared for this year's Open House: an upgrade to its Little Guy Max and a brand-new entry: the Little Guy Mini Max. Changes to the Little Guy Max, a 21-foot, 3,100-pound teardrop, include the addition of friction hinges on the main entry door to let campers to keep it open at any angle without fear of it slamming shut suddenly, and a one-piece shower. According to Director of Sales Anthony Chiera, "the changes may seem small, but they are designed to increase capacity and make the trailer easier to use." In terms of capacity, the 2019 release has a 30-gallon gray water tank – more than twice the size of the one in the 2018 model. 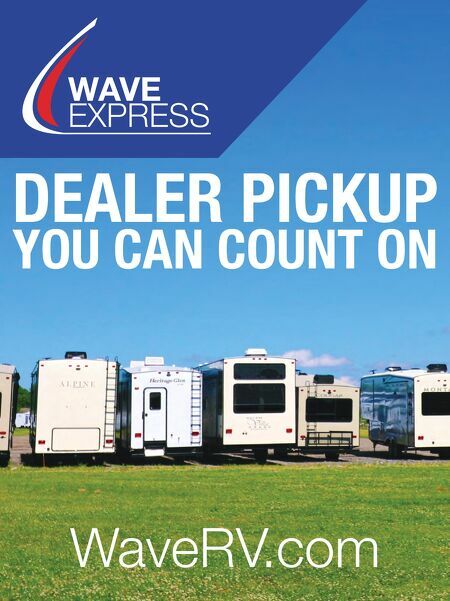 It also has 12-volt TVs that can be powered by battery or park hookups, and the once-optional Keder rail is now stan- dard, allowing purchasers to choose from three custom options: a Pahaque visor, an awning, or a tent. These are usually set up on the door-side of the trailer, offering extended protected space for dining, reading, relaxing, or entertaining. At the same time, the formerly standard Thule awning is now an optional upgrade. Additional new upgrades are 12-volt and DC-USB outlets and factory-installed 200-watt solar panels. The Mini Max teardrop is indeed smaller – only 1,900 pounds and 17 feet long – but it includes all the same amenities as the Max. Chiera says it was "designed to reach a broader range of camping enthusiasts," including tent campers looking for their first trailer, fifth wheelers looking to downsize, and anyone else looking for something compact and efficient. Chiera says both the Max and the Mini Max can easily be hauled by one of the approximately 5 million vehicles on the road today that are capable of hauling up to 3,500 pounds, adding that both are "high-quality trailers built on tubular steel frames with two-year warrantees." While it will not be ready for Elkhart Open House Week, Liberty is bringing out a new version of the My Pod, which will weigh only 600 pounds, enabling it to be towed by a four-cylinder smart car. INTECH RV According to Rich Schnippel, director of RV operations for Nappanee, Ind.-based, inTech is unveiling two new models at this year's Open House Week. The Sol reflects the company's focus on small campers, but is "a bit larger than the micro tear- drop and adventure trailers we've offered in the past," and the Luna Rover, which is part of their Flyer lineup, is an off-road version of the Luna the company introduced at last year's event. The Sol is inTech's first entry into travel trailer territory and is being offered first as a single-axle model, with a slightly larger tandem axle model to follow. The single axle is 20 feet long and Schnippel's best estimate of the weight is between 2,500 and 3,000 pounds. He says the Rover resembles the Luna teardrop trailer in that it shares a very similar fiberglass front cap with a panoramic front windshield. The Rover represents "a natural progression in size for our company because we believe there is a niche market where retail customers are looking for a higher-end, higher-quality product," Sippel says. The panoramic windshield, in combination with the other large windows, "really expands the camper so it feels open and airy," he adds. 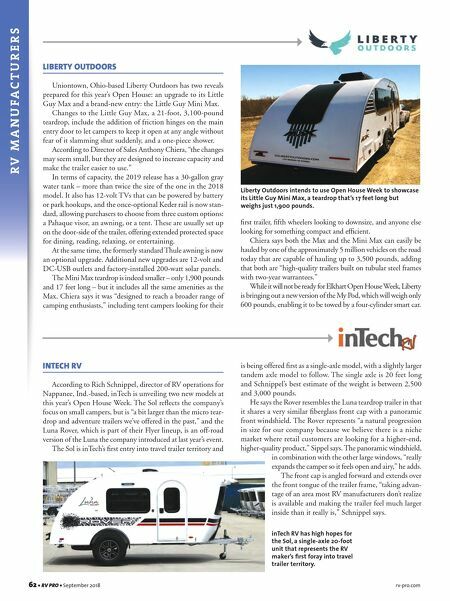 The front cap is angled forward and extends over the front tongue of the trailer frame, "taking advan- tage of an area most RV manufacturers don't realize is available and making the trailer feel much larger inside than it really is," Schnippel says. Liberty Outdoors intends to use Open House Week to showcase its Little Guy Mini Max, a teardrop that's 17 feet long but weighs just 1,900 pounds. inTech RV has high hopes for the Sol, a single-axle 20-foot unit that represents the RV maker's first foray into travel trailer territory.